Watching the original Doctor Who series from the beginning is a very strange experience. I've not seen the new show (the 2005 revival), and, as I mentioned before, I only had previously seen some Tom Baker (mostly) and Peter Davison (very few) episodes on PBS back in the '70s and '80s. I've now watched all of the first three seasons, featuring William Hartnell as The Doctor. And the third season was the most difficult to watch. Partly because of the 10 serials (45 episodes), only three (12 episodes) are complete. There are five episodes that still exist from three serials, and four serials (13 episodes) that are completely missing. So, of 45 episodes, 27 are missing. Of the missing episodes, the sorta-standalone Mission to the Unknown, was animated by the BBC for inclusion on a home video release. The others have audio tracks available, and have been reconstructed using stills and snippets of video from the episodes, along with the occasional home video fill-in (some actually well done, some not). The season featured massive turnover in the Doctor's companions. Season Three began with Steven and Vicki, but that didn't last long. Vicki (Maureen O'Brien) left after the Siege of Troy (the 4-episode serial The Mythmakers, all missing), being replaced by Katarina (Adrienne Hill), who was killed off four episodes later during the 12-episode serial, The Daleks Master Plan (9 episodes missing). That serial was notable for the introduction and departure of Sara Kingdom (Jean Marsh), who traveled with The Doctor and Steven, just like a companion. Sources vary on whether or not to count her as an official companion. She was around longer than Katarina, who was officially a companion, so I say she counts. 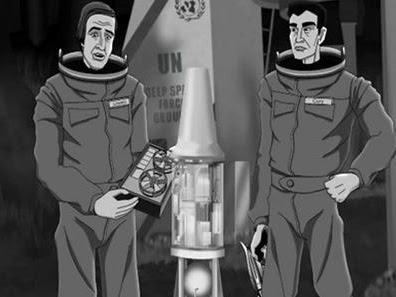 Another thing about that serial was actually its prequel, Mission to the Unknown (reconstructed by BBC animation). After the first serial, the standalone episode was broadcast as part of the Doctor Who series, but none of the Doctor Who regulars -- The Doctor or his companions -- were in the episode. That episode was followed by the serial that saw Vicki leave, then the 12-episode The Daleks Master Plan was aired, using plot points from Mission to the Unknown. I don't know why they didn't include the standalone into the Master Plan serial, unless it was because they were planning to spin off characters and situations, and separated it from the rest of the serial. I'm just guessing. Another companion, Dodo (like the bird), joined at the end of The Massacre of St Bartholomew's Eve (4 episodes, all missing), an historical serial about, you guessed it, the St Bartholomew's Eve Massacre. At the end, they tied Dodo Chaplet (Jackie Lane) to one of the characters in 1572 Paris, and had her accidentally joining The Doctor and Steven around the universe. There was one other historical episode, but it was awful. Atrocious. Even -- dare I say it? -- bad. The Gunfighters (4 episodes) took place in 1881 Arizona, in the little town called Tombstone. Yes, it was their Gunfight at the OK Corral episode. Star Trek did a better job with it. They got it all wrong, from the reason for the gunfight, to the participants, to who was killed, to ... well, they got it all wrong. Oh, and the usual horrible British-as-Western accents. Apparently, the BBC couldn't find anyone who could do an American accent free to appear on Doctor Who. And, the writers couldn't find their Encyclopedia Britannica to look up anything about the Gunfight. Steven (Peter Purves) left at the end of the next-to-last serial of the season, The Savages (4 episodes, all missing). Dodo left at the end of the last serial, The War Machines (4 episodes), which took place in 1966 London. Two characters from that serial, Polly (Anneke Wills) and Ben (Michael Craze), accidentally left with The Doctor as the episode, serial, and season ended. A little more about The War Machines. The plot was to hook up computers from all over the world together (pre-Al Gore Internet?). Oh, and the central computer decided to take over the world and enslave humanity. Kind of a pre-Terminator Skynet. And, next time you're on Jeopardy and the answer is "The only serial of the classic Doctor Who series where The Doctor is called 'Doctor Who,'" you'll have the question ready. Oh, that season was hard to get through. Some of the stories were okay, but the reconstructed episodes are often hard to follow. I find it necessary at times to read synopsis after reconstructed episodes to make sure I didn't miss anything. I often do. Funny thing, though. I had understood that William Hartnell left at the end of Season Three. I wasn't expecting him at the opening of Season Four. Well, now I am. Time to tune the Roku to the TARDIS and see how that worked out. Hey, it just occurred to me -- by the end of all this, you'll be a Foremost Expert on Doctor Who. In other words, you're working towards your Doctorate -- but that joke must already have been made by someone, somewhere (sometime). However then you get into the Jon Pertwee years which in my opinion are some of the best. He's Earthbound for a lot of it (easier on th budget I guess) but the show really comes to life. I think Pertwee was the first acyor that really suited the role. "If you're wondering how he Joel eats and breathes And other science facts Then repeat to yourself 'It's just a show, I should really just relax.'" 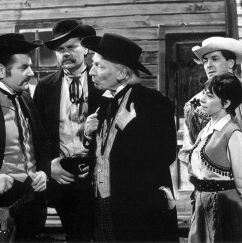 You're right about the accents in the Gunfighters but in fairness, even fifty years later, 90+% of the British accents heard in US tv shows are unlike anything you would ever hear in the UK and the reverse is probably also true. P.S. Pertwee is my preferred Doctor although I also liked Tom Baker. I watch them over and over. I love the old series. I just wanted to mention something I read a while back about The War Machines. The couple in the very last shot were supposed to be Barbara and Ian, but the actors were unavailable. I always thougt it odd that they shot the scene without them.